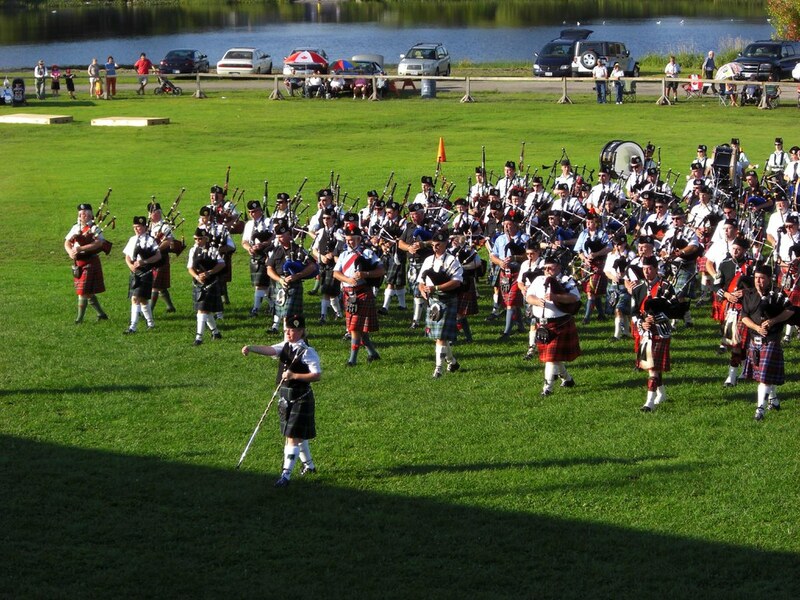 10 Things to Do in Almonte Ontario! Based on the popularity of my “10 Things to do In Kenora” post, I’ve decided to make it a series! And my adopted hometown of Almonte Ontario is next on the shopping block. (Har dee har.) So here we go! The Almonte Riverwalk is actually pretty spectacular. At the top of the hill is a bench they made from an old millstone (yes, its a mill town!) In the summer there is a little ice cream shop at the end of it, a reward for your trek. (Your 2 block trek!) Best to start at the Old Town Hall, and head down along the river, as then you have gravity on your side. There’s a boardwalk and series of bridges that lead along the various sets of falls. The water is shallow and you can see little fish and fun condos from the back. Grab a root beer float from the ice cream shop (Waterfall Delights! ), then continue down Mill Street and across Almonte Street and down to the boat launch, which has a pretty great view at sunset. Blackbird and Design by Destination have uber cute gifts, notably gorgeous housewares at the former and fantastic import scarves at the latter! Then run one of my favourite errands: Buy a birthday card from Robin’s Paper Thin, head over to the Groundz Cafe (Now the Palms Cafe) for a coffee and panini, and write your birthday wishes from Almonte! The post office is just across the street. Buy a fancy stamp – those always make people’s days. Summer 0f 2010 Update – We now have a Creperie! Check out the Mill Street Crepe Company in Heritage Court at the bottom of Mill Street. Yummm…. Bicycle Month doesn’t really count as a festival, but it was pretty epic this year. And so on and so forth. The days are just packed! Check it out! 4. Take a bike ride! Almonte people like to bike. Take a scenic (or challenging!) ride around the country roads – here is a handy map of some different routes that they put together during Mississippi Mills Bicycle Month! You can check out bridges, an alvar area, a handful of cemeteries. I recommend working an iced coffee from Equator Coffee Roasters into your route! Its on Houston drive, down the street from the Independent Grocer’s. 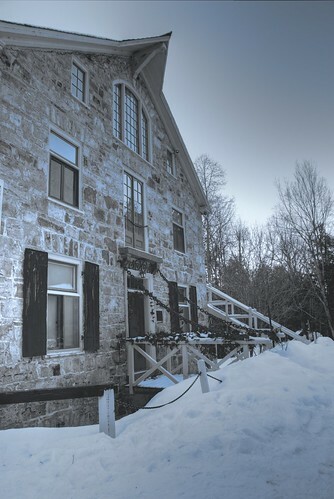 There is a network of great trails all around a beautiful creek and this old building, which was once the studio of Dr. R. Tait McKenzie, and is now a museum with his works. Its a beautiful piece of land – people get married there! There’s nowhere in Almonte (that I know of?) to rent skis, but you can rent them from Bushtukah or MEC. Then, maybe a hot chocolate at the Groundz Cafe? 6. Take a pottery class at Almonte Pottery Guild! I haven’t actually done this yet, but once I finish upholstery at My Upholstery Shop, I will! Almonte has a great community of artisans (check some of them out during the fall Crown and Pumpkin studio tour!) and there are loads of classes. This one I am excited about, because I find pottery to be pretty much like therapy – its so relaxing. You could also try jewelry classes from Kehla Design or fine woodworking at the Rosewood Studio. 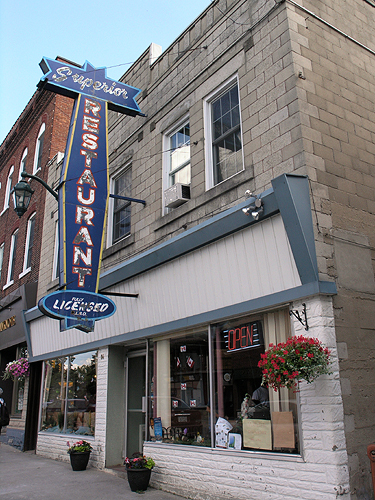 If you can make it out early enough, the third Saturday of every month, the Almonte Legion hosts an egg and bacon breakfast for $5. It is pretty much the best deal around! You get eggs, bacon AND sausage, pancakes, homefries, and coffee and juice! They put a sign out front on the Friday before, or I guess you could call them to make sure that its running. : ) It runs from 8-11AM usually. More importantly, every Saturday morning during the summer in the library parking lot, there is a small but spectacular Almonte Farmer’s Market! Check it out for delicious baked goods, local produce, meat and eggs, and bedding plants and cut flowers. It is my new favourite farmer’s market. This is one of my favourite places to bring visitors, just because it has a great view and a very relaxed atmosphere. The serve brunch on Saturdays and Sundays, and it is pretty good! Also there is loads of patio space in the summer, so lots of room to while away a summer evening with a pint. More importantly, if you come in the spring, the water rushes past the windows in the hall where you walk to the back room, and it makes you feel like you’re in a boat heading upstream. Its a very cool location! And last time I was there the waitresses were super nice. 9. 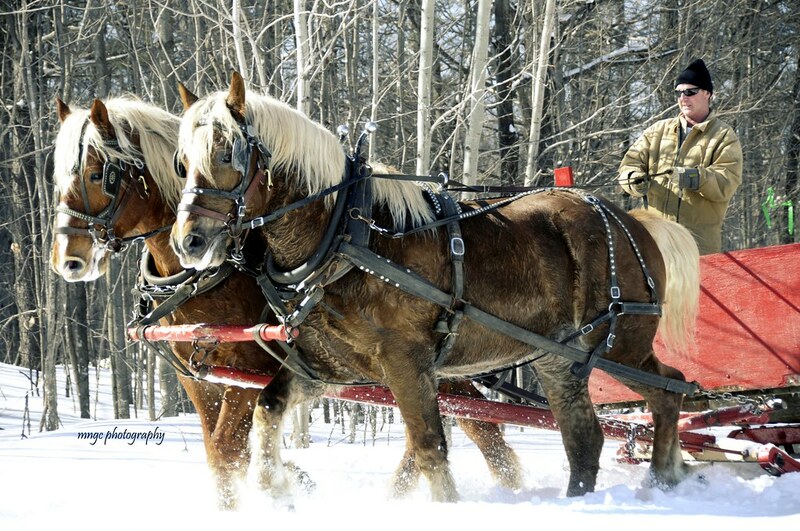 Visit a SugarBush! And Pakenham! 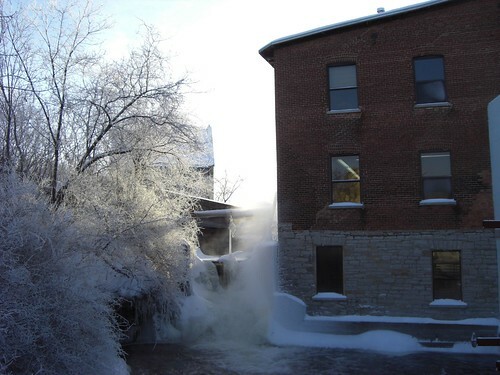 There are several sugar bushes around Almonte (did you know Lanark County is the Maple Syrup Capital of Ontario? It IS!) but the closest one is Fulton’s Pancake House. Its actually closer to Pakenham, but hey, we’re amalgamated now! They are open all year, and have pancake breakfasts throughout the winter. The day we went, there was live music, which was fun to eat pancakes to. There’s a gift shop, a maple taffy stand and sleigh rides. All the maple goodness! While you are in Pakenham, stroll over the 5 span bridge (one of Lanark’s Seven Wonders!) and go to the General Store. I have also heard great things about the Copper Kettle, which is a little restaurant run by a Hungarian (I think) couple. Call ahead, but it sounds pretty amazing. The same friends also run Riverbend Campground in Pakenham if you want a scenic place to pitch your tent (or RV?). Play a round of horseshoes on the banks of the Mississippi! Probably you won’t want to play in the falls when it looks like this, but in the summer, its very fun to hop along the rocks and try not to soak yourself. There is a short trail and some bridges, as well as a grassy picnic area. 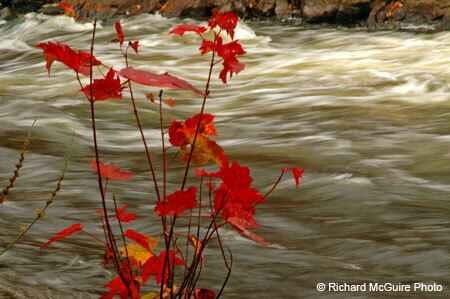 To get to the falls from Almonte, you take Martin Street West to Blakeney Road (South). Well that should give you a start on getting to know my little town! I hope you like it as much as I do. Would I lie to you? 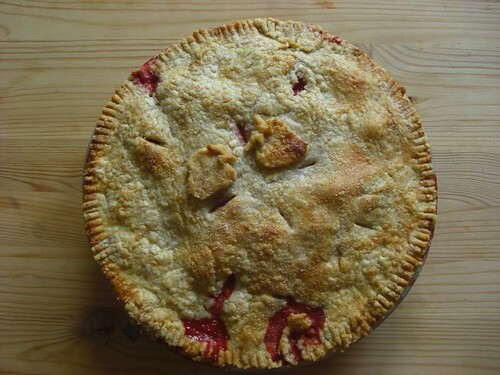 As promised, a delicious recipe for Strawberry Rhubarb Pie, just in time for the END OF STRAWBERRY SEASON! I know, its so sad. But we soldier on! Alors. Line a 9″ Pie Plate with pastry. Combine fruit and dry ingredients in bowl, put into pie shell. Dot with butter. Cover with other half of pastry, flute edges and make slits for steam to escape. Brush top with milk and sprinkle with sugar. Bake in 425 degree oven for 15 minutes, reduce heat to 375 degrees and continue baking 20-25 minutes until fruit is tender and crust is golden. We made this two weekends ago with fruit from the Almonte Farmer’s Market and it was delish! It was pretty good for my sister’s first pie. I hope you enjoy it, maybe next summer when the strawberries come back. I will try to come up with some more seasonally appropriate recipes soon.